Most of our evening meals are simple, often pulling from the freezer any leftovers from my weekend cooking marathons. We spend our energy taking care of the boys, coaxing them to eat their dinner and use good manners, and conversation centers around the day and what the boys did in school or any new milestones. We try to minimize the chaos, but I’ll tell you we’ve heard it all during dinner. By the time we get the boys to bed we’re both exhausted and can easily fall asleep wherever we sit, but sometimes we just need a night out, or at least a night when we put the kids to bed early and enjoy a quiet dinner with good wine and an evening of conversation. On those nights I like to try something new or introduce Michael to one of my favorite meals, like this one. My first taste of steak au poivre was years ago at the Hotel Pozo Azul on Lago de Tota in Boyaca, Colombia. The thing to eat when visiting Tota is trout (trucha) because the lake is filled with it (introduced, not native), but after having it for a couple meals I wanted something different. The beef in Colombia is good, and I decided to try the steak. It was cooked tender, crusted with peppercorns, covered in a good sauce, and I fell in love with steak all over again. 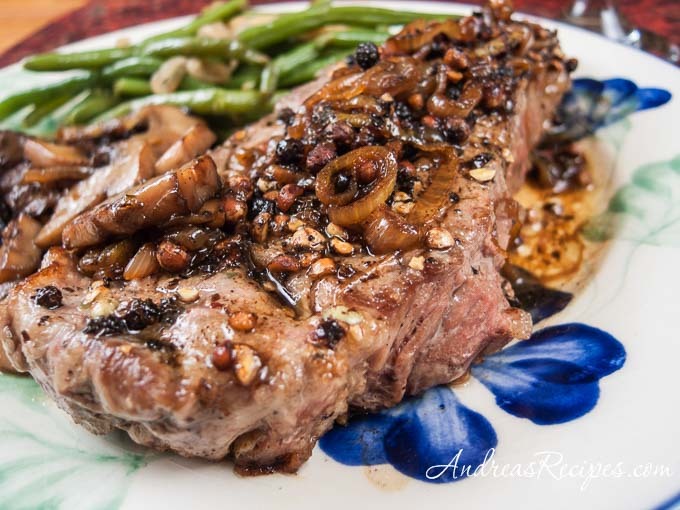 Traditional accompaniments for steak au poivre include mashed potatoes or pommes frites, though I felt adventurous this time and sauteed some baby porta bella mushrooms then served it all with brown butter green beans. Though I was not brave enough to flame the pan sauce, it still reduced nicely. We swirled pieces of the medium-rare steak in the cognac sauce and crunched on the peppercorns, savoring their the spicy flavor. Steak recipe adapted from Julia and Jacques Cooking at Home, by Julia Child and Jacques Pepin. 1. STEAK: Trim the steak of all the surrounding fat and cartilage. Cut the meat into 2 pieces and crush the peppercorns using the bottom of a heavy skillet. 2. Sprinkle salt lightly on the top and bottom of the steaks. Press the cracked peppercorns on each side of the steak, coating lightly or heavily to your taste. 3. Heat the oil and the butter in one of the pans over high heat. When the pan is hot, carefully lay the peppered steaks in. Fry for about 2 minutes on one side, until well seared. Turn the meat and cook the other side for about a minute. Press your finger into each steak to test. If the steak feels slightly springy, that means it’s rare. Cook another minute or two for medium rare. Remove the steaks to a warm platter and cover with foil. 4. PAN SAUCE: Add the shallots to the pan and sauté briefly, stirring with a wooden spoon to scrape up the drippings. Carefully pour in the cognac, leaning away from the burner. Tilt the edge of the pan slightly over the burner flame to ignite the alcohol. The cognac will flame for a few seconds as the alcohol burns off. Cook for another 30 seconds then add the stock. Bring the liquid back to the boil, and cook about 1 minute to thicken the sauce, stirring occasionally. Taste and adjust seasoning. Add the soft butter, swirling the pan until it melts and incorporates with the juices. Serve over the steaks. 5. MUSHROOMS: While the steaks cook, melt the butter in the skillet over medium heat. Add the shallots and cook until soft and translucent. Add the mushrooms and saute until the mushrooms soften and glisten. Add the white wine and the balsamic vinegar, stirring and cooking until the sauce reduces by 1/3. Season to taste with salt and pepper to taste. Serve immediately. If you cook on an electric stove or cooktop, you can skip flaming the pan sauce. The steak looks amazing Andrea! 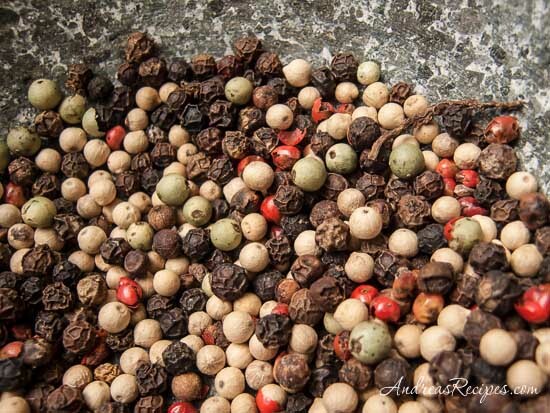 And I love the photo of the pepper corns. I have fond memories of those nights at the dinner table. Now, it’s just the two of us again and we laugh about those nights.